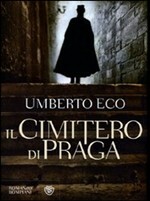 The worldwide best seller, The Prague Cemetery (Il cimitero di Praga, in Italian) is a fictional novel by Italian author Umberto Eco which was published in 2010. The novel starts in Paris, France in March 1897. A man who is variously a secret agent, adventurer and forger is asked to investigate assassination and political intrigue which may affect the future of Europe. His name is Captain Simone Simonini. Various non-fictional characters appear in the novel including are Sigmund Freud, Maurice Joly and Eugène Sue. The novel touches on freemasonry, conspiracy theories, and devil worship. This is a fascinating book from Umberto Eco which, as always is written very well and which has an intricate plot. Well worth a read.